In March 2012, FELSH INTO LIGHT: The Films Of Amy Greenfield will e out from Intellect Books/University Of Chicago Press. Watch for more later . . . The movie Hugo shows that current 3-D can be a work of art. Having written about Michael Powell and Emeric Pressburger’s Tales Of Hoffmann (their “other” dance film – the Red Shoes being their more famous), and having the support on the article of both Scorsese and Powell’s wife and Marty’s edior, Thelma Schoonmaker, and knowing how much Hoffmann has influenced Scorsese’s films, I see shades of Tales Of Hoffmann all over Hugo. The most moving is the theme of something broken fixed, allowed to work again, made whole. But in Hoffmann the dancer when she is revealed to be an automaton is decapitated and broken into pieces in one of the most magical and distrurbing scenes, which uses sleigh-of-hand cinematic practises which go back to, and consiously recall George Melies (in Hugo played by Ben Kingsley). Reversing the theme in Hugo makes it ultimately poignant, not disturbing, and both Melies’ automaton and Melies himself are reinstated, which he actually was historically (though for those who live it, like Melies did, a great artist losing his (or her) purpose- broken – is beyond disturbing. When I saw the film I thought it wasn’t shot in 3-D but made into 3-D afterward.because the 3-D camera rigs are far too cumbersome to do the kind of steadicam virtuosity we see in Hugo. But it was shot it in 3-D. It’s clear that Scorsese wanted the kind of sweeping camera movement, ie on on he veriginous spiralling staircase, as Powell used in Tales Of Hoffmann and which so struck Scorsese even as a child. So they had a steadicam rig made by James Cameron’s company which hadn’t existed before- lighter and better balanced – especially for Hugo. So now the camera can move in all dimensions in 3-D. But does the ordinary movie-going public care about all this? Yesterday my husband,Robert Haller, was at the Staten Island ferry terminal and overheard three Department Of Transportation workers arguing heatedly about Hugo. Robert piped up that it’s a masterpiece. The second guy then piped in “Yes.That’s just what I think. It’s a masterpiece!”. Robert volunteered more and one guy asked if he’d made the film! (Robert does know Scorsese who’s the honorary chairman for the Anthology Film Archives Film Preservation Awards Dinner that Robert originated and has run for many years.) The ferry came in. As Robert left them, the three men were still arguing about Hugo!The men clearly do care. My friend Ricky Leacock passed away on Wednesday. He lent his great being to my work from the mid 70s to 1980 behind the camera. All week I was thinking of him so much. And on Wednesday before I knew he’d passed away I was evoking him, telling a young cinematographer his words to me the first time i met him, “Film isn’t about exposure. It’s about seeing.Very specifically!” And very needed now with new digital cameras coming out every month. How amazing it was to work together. Here’s a picture of him on the set of my film 4 Solos For 4 Women with dancer Suzanne Gregoire. Ricky shot the film. And here’s a frame pull of Suzanne from 4 Solos -Ricky on camera. 4 Solos was (videotaped in the gorgeous old 2″ video format). The camera was gigantic and he hand held it. He was sore for a week. And believe it or not Ricky did the studio lighting a la film noir as i asked him to. very un-cinema verite and seemingly not like Ricky but actually he could be a teddy bear especially with women around to film, loved dance, and was trained as a British lighting cinematographer). The dancers loved working with him. They said they could palpably feel his presence behind the camera. They could dance with him. He knew where they were going before they got there. i’ve been consumed with working on the preparation for filming Spirit In The Flesh. New website up. http://www.spiritintheflesh.net. While theme, the subject if you will, of the film, the Shekhina, as Female, divine source of creation and energy – – of motion, on earth in us, around us, is usually only thought of now (in Kabbalah in US) as “sweetness and light” – comfort,protection, other female associated virtues, that’s so very far from the whole picture. It’s the watered down version. 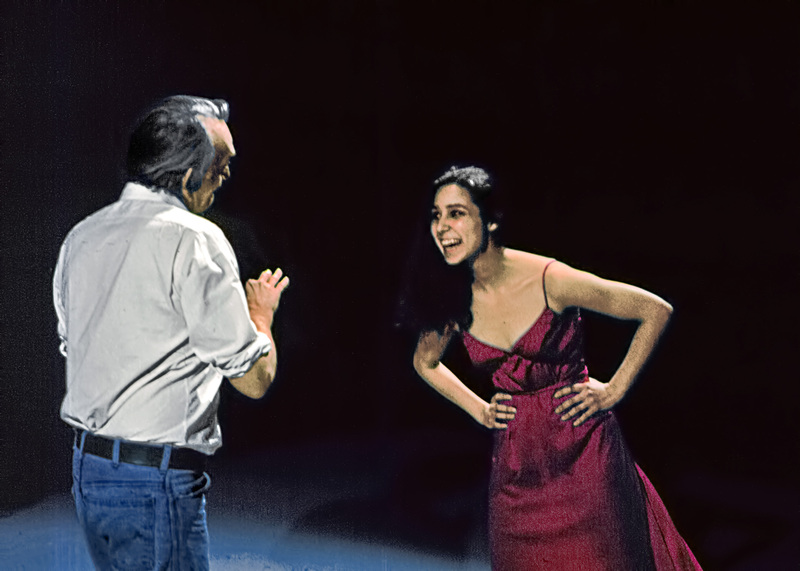 Here is Vittoria Maniglio in a rehearsal photo shoot (photo by Robert Haller) with Leonard Nimoy photo in background – like the photo is the Shekhina in her aspect as the mother of Lilith, and Vittoria is channeling Lilith, which Vittoria really identifies with by the way. Last night I saw Israeli choreographer’s evening long-long piece, Singular Sensation, at The Kitchen Center For Video, Music and Dance (in New York City). I loved it. To me it was about something even more important and elusive than her stated theme: the current overload of our senses from the overload of technology,etc we experience. And while I persoally agree with her statements on this, I can’t articulate exactly what I think the piece is really “about”, but I’ll take a few stabs at it. Part of the strength of Singular Sensation is that it’s not “about” something in any easy, conventional sense. Perhaps it’s “about” our desperate, disrupted, unnamable desire and efforts at contact our need for some kind of “glue’ to make sense of it all – communicating our own madness in a world gone mad. On one level the “glue” is intertwining simultaneous image events clustered and shifting, becoming progressively outrageous and sensation-al. On another level it’s the connection made through the constantly flowing and disrupted outpouring of movement, unpredictable yet coming from a root of passion. Roles are fluid and sexuality hard to define, but neither conventional or reversed. Elusive and wild both. Without judgement. The dancers can go from seemingly untrained natural-like movement, like children playing, to daringly flung virtuosity, but never technique for its own sake. They know just what they’re doing yet operate on the edge of something they can’t control. Singular Sensation reminds me of the origins of Richard Foreman’s Ontological Hysrterical Theater. But Foreman’s Dada hysteria had a conceptual edge of distance. Godder’s is all involved hotness,and while there are men in her troupe, and they’re important, to me it’s very female. As I was watching the performance I couldn’t help figuring out how I’d film it. It would be great to expand the space so that the camera could move freely among the events. To make the Dada/Surreal imagery cinematic would take a few directorial decisions, and a cinematic awareness on the part of the performers. Something she does that’s highly cinematic – instead of the choreographer making the performers into clones of herself, with the same body type, training and way of moving, Ms Godder uses them as individuals, with each contributing their individuality, their differences – hey, like a democracy – and like actors are used in cinema. Another cinematic thing: raw energy. Not the polished politeness of so much dance which somehow manages to distance us and deny the cathartic energy which is the life of dance. This morning I woke up energized by Godder and her troupe’s singular sensation and instead of fragmenting in different directions, sat down and focused on writing about Singular Sensation. Job: Assistant to director. Skills: excellent Final Cut Pro, video camera, organization, web skills, and desire to work on low budget film where people shoot from the hip. There will be a travel stipend and meals will be paid for. (see below for more information). Interns who have participated in previous projects with CinemaBody were started on their careers by the credits and recmmendations they received from Amy Greenfield. They have become an A-list feature film editor; the #1 film grip in NYC; cinematographer for one of Greenfield’s award-winning short film which screened in the Berlin Film Festival. Cinemabody is the umbrella for award-winning independent/ experimental film-maker Amy Greenfield’s projects. Her films have been exhibited at the Berlin Film Festival, The New York Film Festival, The Edinburgh Film Festival, won top prizes at the Houston, Atlanta, Williamsburg Film Fests and more ; screened at The Museum of Modern Art (MoMA); Lincoln Center, National Gallery of art, and garnered such raves as a 10 Best in the Arts in the New York Times. The project, Spirit In The Flesh, transforms the photography series, Shekhina, by Star Trek star – turned – photographer, Leonard Nimoy, into a film joining performance, words, music (by downtown music star, John Zorn) with Nimoy’s photographs to bring to the screen a personification of Shekhina – in Kabbalah, the invisible female divine spirit which is the animating force in ourselves and our world. The film, like the photographs, takes as its aim to create, “The photographic image of the invisible” (Nimoy). 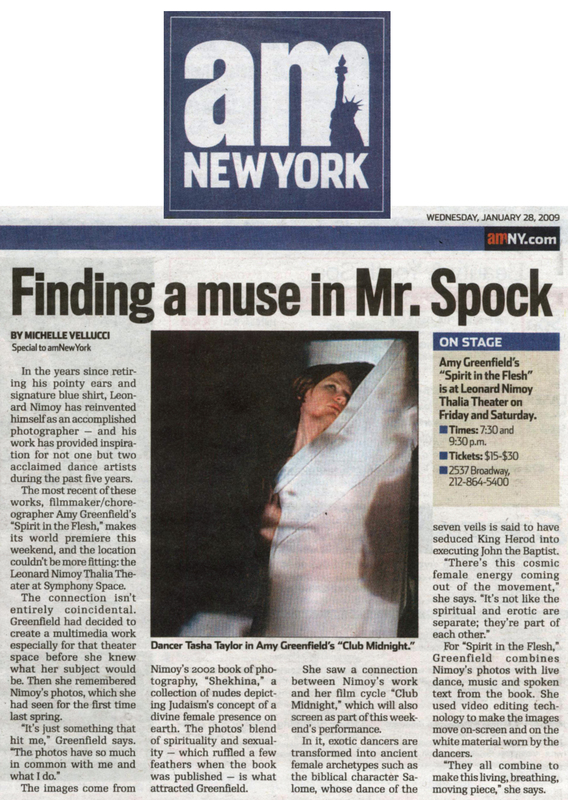 The film will transform a multimedia performance presented in Manhattan in 2009. Half the film has been shot. The video excerpt below is an in-progress demo made from an excerpt of the footage already shot. Interns will work with the filmmaker on rough edits, helping to generate ideas for Greenfield’s professional editor. See the demo of excerpt below. Simultaneously, we will be rehearsing for new sections then plan to shoot them late fall. Interns will gain multiple experience and credits on the film. For instance, part of the performance footage in the demo was shot by my intern, who also worked on internet PR for the multimedia performance. Contact: amygreenfield8@gmail.com. Send resume and cover letter.